​In the hectic routine of the day most of the products of everyday life are taken for granted and used automatically. 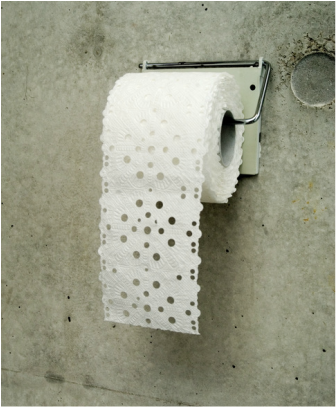 I designed this toiletpaper inspired by the Renaissance - an age when wealthy people used hand-stitched lace as toilet paper - to make us aware of the luxury of possessing toiletpaper in our daily life. Its intricate pattern slows to attention the fast-moving eyes and hands of modern man or woman, calling for more delicate use.